The great forest of Sherwood in Nottinghamshire with its association with the legendary Robin Hood is now an eighth the size it was in the thirteenth century. Yet somehow it has survived, along with its Hood myth, into the 21st century, just over 1,000 acres of woodland, a forest since the Ice Age, once covering a quarter of Nottinghamshire at the time of the Domesday Book in 1086. Now it is looked after by the small Sherwood Forest Trust with help from the Forestry Commission. It is still important for its ancient oaks, pasture land and fungi. ‘Rymes of Robin Hood’ referenced in ‘Piers Plowman’ around 1380 mention the outlaw Robin Hood and his ‘merry band’ as living in the forest, robbing the rich and helping the poor. The outlaw band included archetypal English figures such as Little John, Will Scarlet, Friar Tuck and Maid Marian. Robin, always dressed in green, takes us back to the Green Man and his presence on May Day certainly as early as the 15th century, although Hood and Marian were referenced in French texts as early as the 13th century. It is only in the 17th century that Robin becomes associated with Nottingham – earlier tales are set in West Yorkshire according to Jennifer Westwood’s research in ‘Albion – A Guide to Legendary Britain’ (Granada 1985). Nevertheless, Sherwood Forest and Robin Hood have remained in public consciousness as a place of sanctuary for the morally good outlaw with a children’s t.v. series popular in the 1950’s and a 2006 drama for the B.B.C. The managing of tourism has now impinged with the Annual Robin Hood Festival taking place in August. However the major oak still stands proud, though supported, at around 900 years old. 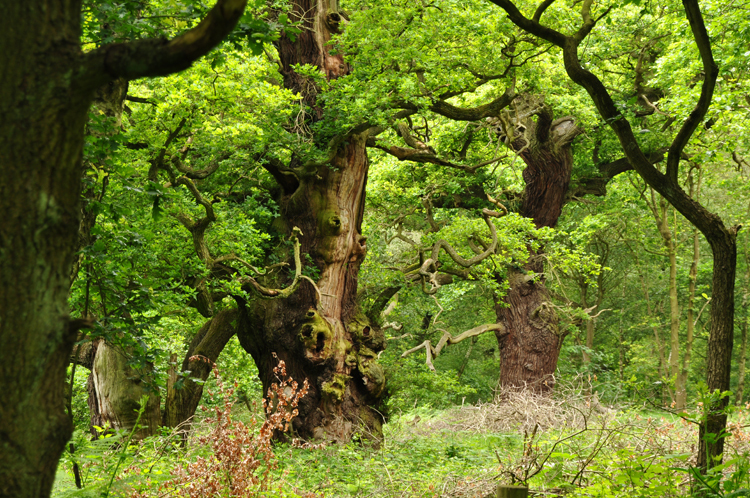 Location: Sherwood Forest is 25 kilometres north of Nottingham and 4 kilometres west of New Ollerton. Road access is from the B6034 (via the A616 or A6075). The site has a visitor centre with car parking.